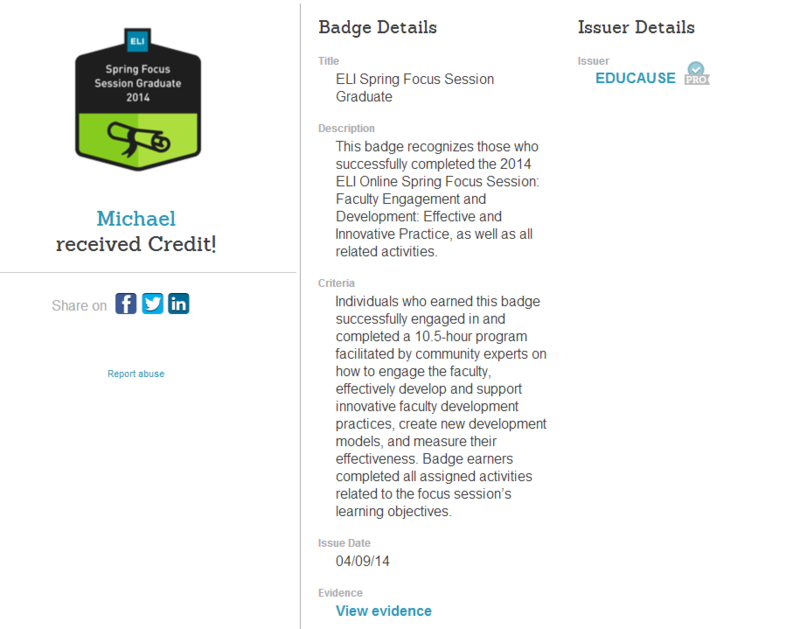 Last week I attended the Educause Learning Initiative (ELI) Online Spring Focus Session on Faculty Engagement and Development: Effective & Innovative Practice. 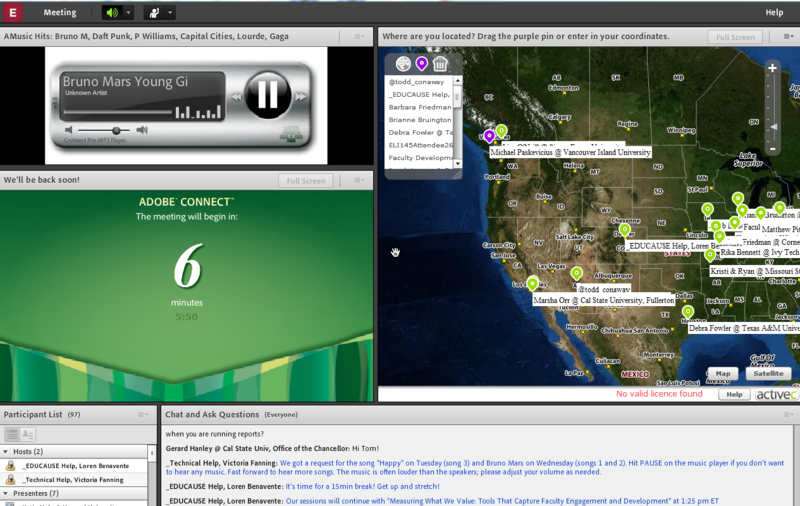 The session ran over three days from 9am-1pm online in Adobe Connect, an asynchronous collaborative meeting room very similar to Blackboard Collaborate used on our campus. I am estimating that roughly 50-75 participants from all across North America participated in the sessions. The program was full of interesting sessions from speakers the US and Canada. You can view the full program here. During the session I reflection on the way in which our facilitators orchestrated the event; speakers spoke for 15-20 minutes each and the group had breaks after four sessions and a question and answer session. Questions from the audience were only accepted via text chat I Adobe Connect and Twitter using a specific hashtag. The facilitators were diligent in collecting the questions which arose during the sessions and ensuring the questions were addressed by the speakers in the question and answer period which followed the sessions. Facilitators and presenters made frequent use of polls during the sessions to gather feedback from the audience. Presentation media and accompanying documents were also made available in real time through the Adobe Connect environment and the conference website. During the break our facilitators organized fun quizzes and played popular music through the environment. I really enjoyed the entire experience of participating in this online conference. Even though attendees were not able to use the microphone I felt my questions put through the text chat were all addressed during the Q&A. Furthermore I felt compelled to complete three assignments which were described at the end of each day of the conference. I noted that many participants actually completed the assignments as well, the reward for doing so was a badge issued from the ELI. My badge can be seen below. My reflections from the session are available here.